KUALA LUMPUR: Over the past couple of years, stock exchanges around the world have been busy creating and amending regulations to make initial public offerings (IPOs) an attractive means of fundraising for technology companies looking to raise capital. However, such companies still appear to be eschewing publicly floating their shares as private equity firms and venture capitalists are said to be offering better deals. “It’s all about getting the highest valuation. And at this stage, private investors are definitely offering better valuations than public exchanges,” said Jeffrey Chi, managing partner of Shanghai-based Vickers Venture Capital. Speaking during a panel discussion at the Wild Digital Southeast Asia 2018 tech conference in Kuala Lumpur early this month, Chi added that while there is no dearth of stock exchanges on which to list, companies are “first looking at themselves to ask where they can attract a higher valuation and better liquidity”. There appears to be no dearth of private capital prepared to back tech companies, especially following SoftBank Group founder Masayoshi Son’s announcement in May that he will definitely be setting up a second Vision Fund. The first, which was also backed by Saudi Arabia’s sovereign wealth fund, had raised more than US$90 billion. It has dished out less than half that amount with investments in ride-hailing companies like Uber and Grab, co-working firm WeWork and Indian e-commerce giant Flipkart. On top of better valuations from private investors, Chi said that having so many choices of stock markets are not necessarily a good thing for tech companies and start-ups. “Navigating the system of stock exchanges can sometimes be more, if not as confusing, [than the market for private capital,]” he said. Several other factors may also behind the less astronomical valuations seen on the public market, including a more rational investing public. Alain Lam, Credit Suisse Investment Banking and Capital Markets managing director and head of tech and media for Asia-Pacific, opined that investors are now pricing IPOs more appropriately. He said that although some tech stocks are still running ahead of fundamentals as investors chase growth, prices are generally in line with such firms’ fundamental value in the long term. However, a current mismatch in supply and demand for such stocks may also be pushing up valuations for existing tech firms, he said at the panel discussion. 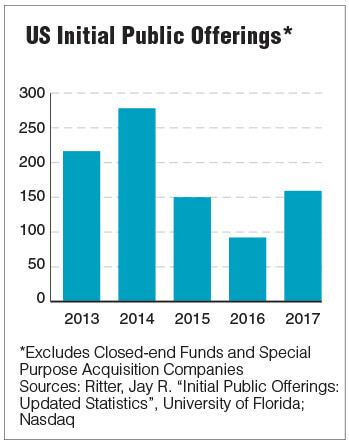 “I would say that there’s still a lot of capital out there chasing IPOs. Despite the interest rate increasing several times this year, there’s still excess capital in the market [that] doesn’t have anywhere to go,” Lam said. “If you look at [the IPO market] over the last eight months, a lot of it is predominantly from the tech world. It has become very concentrated. So when you have a large pool of money chasing around a small pool of supply, unfortunately the supply and demand is not balanced. On the other hand, not all investors are sure of what to expect from new-age tech companies. “[In] Hong Kong, some of these new economy IPOs are not performing as well as the broader market. I think it’s partly because the market is still beginning to know how to value these companies on a long-term basis,” Lam said. Notably, mobile device maker Xiaomi saw its valuation slashed by almost half to US$54 billion (RM219.24 billion) from US$100 million ahead of its July 9 listing on the Hong Kong Stock Exchange. Conversely, many investors also become “too excited” when it comes to Tencent- or Alibaba-backed companies, resulting in a frenzied rush for these stocks. According to Rebecca Smith, Nasdaq’s head of listing and capital markets for Asia-Pacific (excluding China), 64 companies are currently filed to go public before the end of the year. “We expect to see continued momentum in the second half of the year,” she told The Edge Financial Daily via email. However, Smith acknowledged that there are 1,000 fewer companies trading on the US market than there were a decade ago. As such, she noted that there is a growing need to address structural changes in the US markets. Smith pointed out that Nasdaq is currently embarking on its revitalise initiative, a blueprint for reform designed to modernise market structure, reconstruct the regulatory framework and reorientate to a longer-term view. Currently past the one-year mark, the exchange has already engaged with US lawmakers for tougher regulations on proxy advisory firms, streamlining the quarterly filing process and easing the pressures of fragmented trading for thinly traded securities. Compared with two IPOs from the Asia-Pacific in the first six months of 2017, this year saw nine Asia-Pacific companies joining Nasdaq, including iQIYI, Bilibili and Uxin — three of the top 10 tech deals in all US markets, noted Smith. “Technological innovation is gathering pace in the region and we are particularly excited to see much higher level of activity and interest throughout Southeast Asia,” she said. However, choosing which market to be listed on remains a factor for firms to consider. “(For) companies with a global audience, it makes sense for them to be listed on a global stock exchange. But to be listed in Hong Kong, a lot of times I advise my clients to have some sort of Chinese story so that you can (relate) to some of the investor interest from China,” Credit Suisse’s Lam said, adding that the same is true for corporations in Southeast Asia. Globally, he opined that boundaries between different stock exchanges are blurring as investors are exposed to global stocks. By this logic, it shouldn’t really matter where firms are listed as the valuations should be similar. But in reality, there is still a difference in the sophistication of local investors. Lam pointed out that while the top companies by market capitalisation on US stock exchanges are tech companies (Apple Inc, Google’s parent Alphabet Inc, Microsoft Corp, Facebook Inc and Amazon.com Inc), most markets in Asia are still dominated by titans of traditional industries such as banking and power. To prove his point, while Tencent is currently in pole position on the Hong Kong Stock Exchange, it is followed by three banks and one oil and gas company — the Industrial & Commercial Bank of China Ltd, China Construction Bank Ltd, PetroChina Co Ltd and HSBC Holdings Ltd.
“[Asian countries] are trying to encourage more local tech champions but at the same time, we require the local investor base to be more sophisticated,” Lam said. At the end of last month, the Singapore Exchange announced that dual class shares can now be traded on its market. On this side of the causeway, the Leading Entrepreneur Accelerator Platform (LEAP) market was introduced by Bursa Malaysia last year, although trading on the exchange is only open to high net worth sophisticated investors. “Someone needs to take a leap of faith, like Tencent did on the Hong Kong Stock Exchange. For them to be the first one, to prove success is possible,” Lam said. Nevertheless, the region remains comparatively robust when it comes to tech companies that are eyeing IPOs. “I think it’s fair to say that compared to my US counterparts, the pipeline is stronger in Asia and China,” Lam said. He further opined that upcoming “tech companies” in the region may simply be built on the evolution of industry captains. “Going forward, I think we will see a lot of old-style companies re-branding as tech companies, such as automotives [and] logistics. These industries have existed for a long time but you see them being transformed,” he said. Healthcare is another industry that is seeing a pickup in interest, with a “boom in terms of biotech companies being listed in Hong Kong,” Lam said. However, any continuation in this trend will depend on how these companies are traded and perceived by the market before others follow in a second wave, he said. As for the slew of fintech companies that were listed over the past few years, Lam noted that while they are now trading at high valuations, new listings of similar companies have slowed down due to a still-developing regulatory environment.